Independent Study Guide - Track A: complementing the text of Law Enforcement by Tara Potterveld. 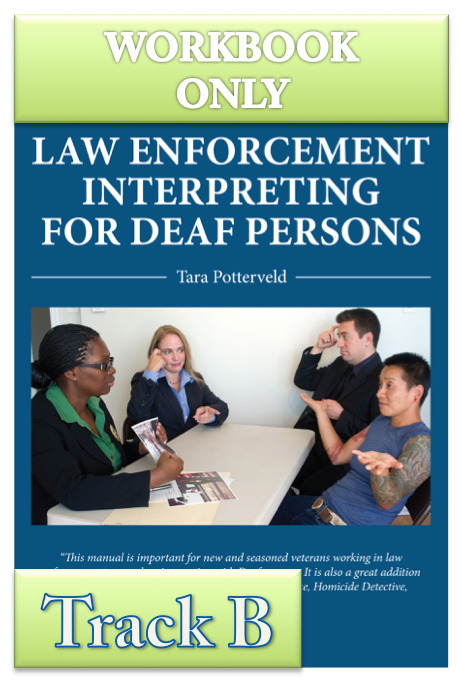 Track A has one hundred questions that correspond to the ten specific chapters in the manual, Law Enforcement Interpreting for Deaf Persons. The questions in these tracks include multiple-choice, true or false, fill-in-the-blanks, and brief written answers. Most answers are found in the manual, however, some questions require the user to do web-based research or create a visual recording of oneself. In some cases, there may be more than one correct answer to a question and it is more important to be able to justify and support the answer you have provided. The web-based research will assist in learning the laws and codes particular to the jurisdiction where you live and work. Purchase this if you already own a copy of the Law Enforcement text and need only the study guide. Independent Study Guide - Track B: complementing the text of Law Enforcement by Tara Potterveld. 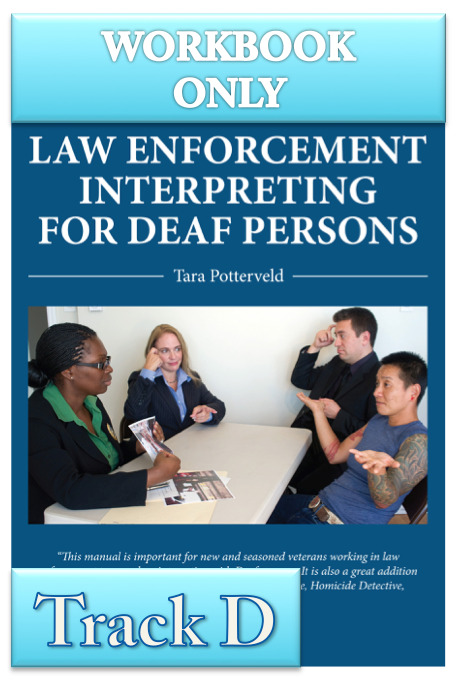 Track B has one hundred questions that correspond to the ten specific chapters in the manual, Law Enforcement Interpreting for Deaf Persons. The questions in these tracks include multiple-choice, true or false, fill-in-the-blanks, and brief written answers. Most answers are found in the manual, however, some questions require the user to do web-based research or create a visual recording of oneself. In some cases, there may be more than one correct answer to a question and it is more important to be able to justify and support the answer you have provided. The web-based research will assist in learning the laws and codes particular to the jurisdiction where you live and work. Purchase this if you already own a copy of the Law Enforcement text and need only the study guide. Independent Study Guide - Track C: complementing the text of Law Enforcement by Tara Potterveld. Track C has one hundred questions that correspond to the ten specific chapters in the manual, Law Enforcement Interpreting for Deaf Persons. The questions in these tracks include multiple-choice, true or false, fill-in-the-blanks, and brief written answers. Most answers are found in the manual, however, some questions require the user to do web-based research or create a visual recording of oneself. In some cases, there may be more than one correct answer to a question and it is more important to be able to justify and support the answer you have provided. The web-based research will assist in learning the laws and codes particular to the jurisdiction where you live and work. Purchase this if you already own a copy of the Law Enforcement text and need only the study guide. 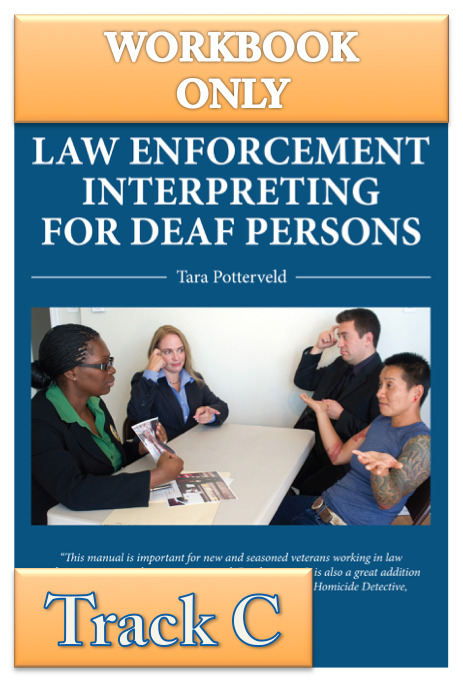 Independent Study Guide - Track D: complementing the text of Law Enforcement by Tara Potterveld. For this track, you are required to find an appropriate mentor to work with you on interpretations of legal concepts. The mentor that you choose should either hold SC:L, CLIP-R, or CDI certification. If this is not possible, work with RID HQ to identify an appropriate mentor. This track may be completed one-on-one, with a small study group, or as part of a classroom curriculum. The meetings with your mentor can be either face-to-face or conducted with a mentor outside of your area by using internet technology or sending DVDs through the mail. This module will provide information regarding educational activities either developed and provided by Facilitators/Instructors, Hosts or RID-Approved Sponsors. CMP-approved Sponsors may either provide or support a learning activity for CEU credits including the types of activities that qualify, requirements for instructors, documentation required, timelines, and evaluation processes. This presentation discusses through a historical lens: the culture, education, and sociolinguistics of Black Deaf people. The era of social marginalization contributed to the development of Black ASL and at least in part, intertwined with the formation of the National Black Deaf Advocates, Inc. (NBDA). This session also discusses experiences of the use of sign language interpreters by Black Deaf people and how the cultural intersections of the greater Deaf community and hearing African-American community impact upon Black Deaf people’s identities. 1) Participants will define the concepts of culture and sub-culture within the Deaf community and its impact upon Black Deaf Community. 2) Participants will analyze chosen cultural identities by Black Deaf people based on the cultural intersections of Deaf community and hearing African-American community. 3) From a sociolinguistic standpoint, participants will become familiar with the disparity of deaf educational segregation system during the segregation era contributed to the development of Black American Sign Language through lecture. 4) Participants will become familiar with the formation of a national black deaf organization that advocates for civil rights and equal access to education, employment, and social services on behalf of the Black Deaf and Hard of Hearing in the United States through lecture. 5) Participants will become familiar with a diverse of Black Deaf consumers that require effective communication in the context of cultural diversity and/or socio-economic factors through lecture. Benro T. Ogunyipe, MPA is a Senior Accessibility Specialist for the State of Illinois, Department of Human Services (IDHS), Bureau of Accessibility and Job Accommodation in Chicago, Illinois. He directs and administers the bureau’s program and training activities to ensure department compliance with Titles I & II of the Americans with Disabilities Act (ADA), Section 504 of the Rehabilitation Act and the department’s legal obligations under the Illinois Human Rights Act. He served as President of the National Black Deaf Advocates, Inc. from 2011 to 2013, and served as Vice President and Chairman of the Board from 2007 to 2011. In 2014 and again in 2016, U.S. President Barack Obama appointed Benro to the National Council on Disability. Benro was also appointed by three different Illinois Governors to public bodies including twice as a Commissioner of the Illinois Deaf and Hard of Hearing Commission. He is the current Board member of the National Association of the Deaf. Benro received a Bachelor of Arts degree from Gallaudet University and a Master of Public Administration (M.P.A.) from the School of Public Service at DePaul University. This module provides a general overview of the RID Certification Maintenance Program (CMP). Subsequent modules in this series will provide specific and detailed information about the various components of the CMP & the processes by which RID certified and associate members maintain certification.